Birmania por la Paz se complace en anunciar que la autobiografia de Zoya Phan, la Coordinadora Internacional de Burma Campaing UK se publica hoy en Inglaterra. Cuando Zoya tenia 14 años la Armada Birmana ataco su pueblo y fue obligada a huir. Vivió en un campo de refugiados en Tailandia antes de llegar a Inglaterra, donde tiene actualmente asilo politico. Está en la Campaña de Birmania desde 2005. 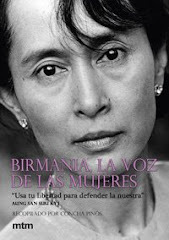 En Inglaterra, “ pequeña hija” esta ya disponible en librerias, online en Burma Campaing UK. Compra el libro aqui : http://www.burmacampaign.org.uk/merchandise.html. ACERCA DEL LIBRO: Zoya Phan nació en las remotas junglas de Birmania y pertenece a la etnia Karen. Durante años los karen han sido victimas de la Junta Militar Birmania: la madre de Zoya fue una guerrillera, su padre un activista de la libertad. Vivió en una cabaña de bambú a las origllas del rio Moei. Desde la selva de Birmania la vimos llegar por primera vez a nuestro país el pasado abril, y en noviembre recoger el Premio Internacional de Catalunya en nombre de Daw Aung San Suu Kyi. Zoya Phan es más que una autora para la Campaña Internacional pues representa aquello que nosotros queremos ver “ el emponderamiento de las etnias en acción”. Deseamos que muy pronto podamos leer el libro en nuestro país. 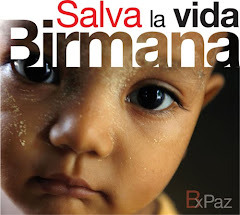 Muchos birmanos continuan sufriendo en las selvas de Birmania y por eso te pedimos que no olvides a Birmania. The Burma Campaign UK is delighted to announce that the autobiography of Zoya Phan, the International Coordinator at Burma Campaign UK, is published in the UK today. When Zoya was 14 years old the Burmese Army attacked her village and she was forced to flee. She lived in a refugee camp in Thailand before coming to the UK, where she now has asylum. She joined the Burma Campaign UK in 2005. In the UK, Little Daughter is available in bookshops, online and from Burma Campaign UK. If you buy a copy via the link to Amazon on our website you can also raise money for Burma Campaign UK. Buy your copy here: http://www.burmacampaign.org.uk/merchandise.html. Amazon are selling the book for just £9.58 including delivery in the UK. The recommended retail price is £15.99. 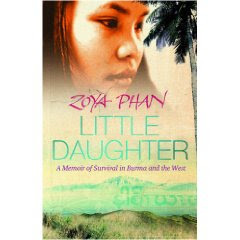 ABOUT THE BOOK: Zoya Phan was born in the remote jungles of Burma, to the Karen ethnic group. For decades the Karen have been under attack from Burma's military junta; Zoya's mother was a guerrilla soldier, her father a freedom activist. She lived in a bamboo hut on stilts by the Moei River; she hunted for edible fungi with her much-loved adopted brother, Say Say. Many Karen are Christian or Buddhist, but Zoya's parents were animist, venerating the spirits of forest, river and moon. Her early years were blissfully removed from the war. At the age of fourteen, however, Zoya's childhood was shattered as the Burmese army attacked. With their house in flames, Zoya and her family fled. So began two terrible years of running from guns, as Zoya joined thousands of refugees hiding in the jungle. Her family scattered, Zoya sought sanctuary across the border in a Thai refugee camp. Conditions in the camp were difficult, and Zoya now had to care for her ailing mother. Zoya, a gifted pupil, was eventually able to escape, first to Bangkok and then, with her enemies still pursuing her, in 2004 she fled to the UK and claimed asylum. The following year, at a 'free Burma' march, she was plucked from the crowd to appear on the BBC, the first of countless interviews with the world's media. She became the face of a nation enslaved, rubbing shoulders with presidents and film stars. By turns uplifting, tragic and entirely gripping, this is the extraordinary true story of the girl from the jungle who became an icon of a suffering land.